Bangkok, Thailand. — Feb 24, 2012 — Select-TV, a global provider of IPTV systems and solutions today launched a new IPTV and Connected TV service in Thailand with Thailand's largest telecom operator TOT (Telecom of Thailand). 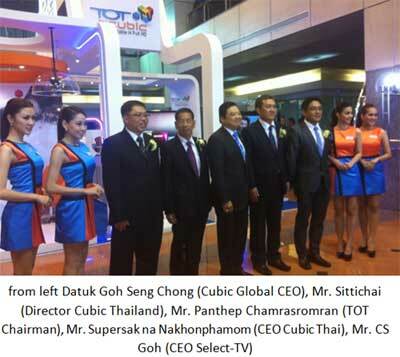 The service named TOT IPTV by CUBIC is a partnership between Select-TV and CUBIC Associates Group in Thailand. TOT IPTV shall be delivered to subscribers of TOT broadband services on Select-TV's EMAGINE IPTV platform. Leveraging on Select-TV's advanced connected TV technologies, TOT IPTV shall deliver interactive content, entertainment and services to subscribers as part of TOT's triple play strategy. TOT is targeting 30,000 to 35,000 subscribers take up rate in the first year for this service. TOT currently target 109,000 subscribers with 10Mbps broadband packages and subsequently roll out the services to all its broadband subscribers which is more than a million in total. obile phones, multimedia and broadband internet." said TOT Chairman, Mr. Panthep Chamrasromran. 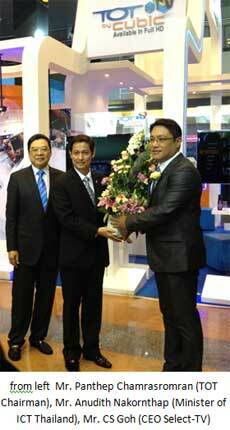 "We intend for IPTV to create a new revenue stream to offset falling fixed-line revenue," he added. IPTV deployment in Thailand. Our teams have worked very hard to address the key requirements to ensure our subscribers' expectations are exceeded. TOT IPTV is a service that brings 4 key elements to subscribers in Thai land, technology, linear content, advanced interactive content and online services. These elements differentiates TOT IPTV from other cable or free to air content platforms." said Select-TV CEO, CS Goh.